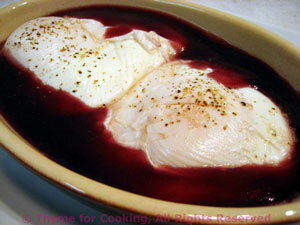 Poached Eggs Bourguignon, Thyme for Cooking simple gourmet starter. This is a simple dish to make. The bright yellow egg mingling with the deep red sauce is visually appealing and indescribably delicious. If you have never poached an egg, don't worry, it's easier than you think. Or, if you have an egg poacher among your kitchen gadgets, use that. Try to use nice, fresh eggs: they are easier to work with and make a nicer presentation. Use a full-bodied Burgundy or Cote de Rhone (or equivalent) for this. Not expensive, but drinkable. Do not use 'cooking wine'. Peel and finely chop the shallots and carrots. Put shallots, carrots and red wine into a small saucepan and bring to a boil. Strain the sauce into a bowl, discarding solids. Put the wine back into the pan and return to heat. Dissolve cornstarch in water and add to wine, stirring until thick and clear. Cover and keep warm.